I watched Mounted Games (similar to Gymkhana) in the Horse of the Year Show in New Zealand last year - what FUN!!! 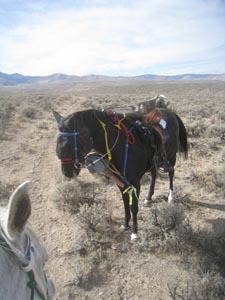 I think you'd do a bit better with ponies than our bigger and not-quite-so-nimble endurance horses, so Connie and I invented our own Mounted Ribbon Games as Connie and I pulled the ride ribbons from the Hart Creek loop. 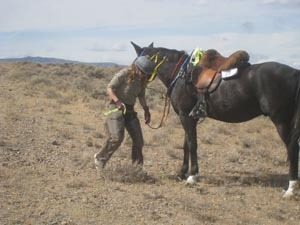 The rules were, if you can pull a ribbon off a bush without getting off your horse, you can clip it in your horse's mane. If you drop it, or have to get off to get the ribbon, then no hanging it in the mane. 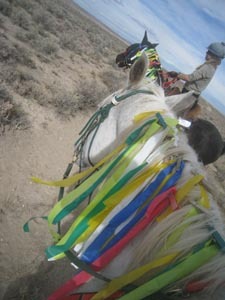 The horse with the most ribbons in their mane wins. 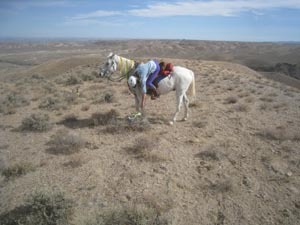 It got a bit more challenging as, on the trail climbing out of Hart Creek, the bushes got smaller and smaller, and so the ribbons got harder and harder to reach. 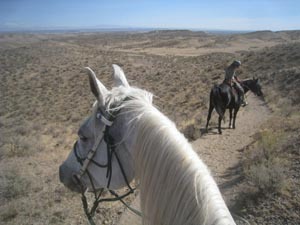 Now Mac is a great ranch horse: i.e. he knows how to stand still. 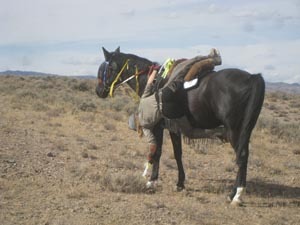 So standing still while I leaned off his side to pluck a low ribbon was no problem. It took a little convincing at first for Finneas to stand still for Connie. After a while he was getting the hang of it, and stood like a statue even when Connie had to reach for a ribbon almost on the ground. 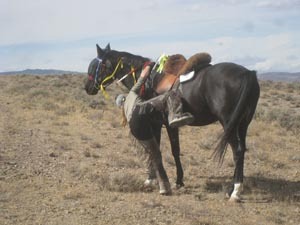 She was able to get the ribbon... but then she got stuck hanging off Finny's side and couldn't get back on! So she had to bail. No pinning it in his mane. 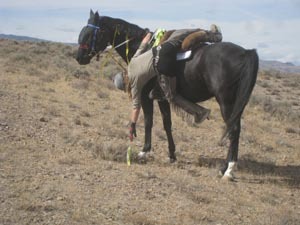 She tried another one almost on the ground, and got the ribbon, but when she tried to shove herself back in the saddle - grabbing onto Finny's breastcollar, which caused him to throw his head up which helped shove her back in the saddle - she dropped the ribbon. So no ribbon in his mane. 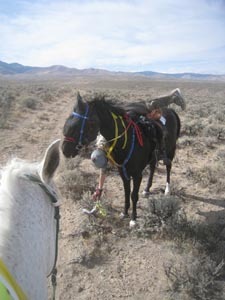 Here (on the black horse) Connie demonstrates the almost-right-way to retrieve a ribbon. 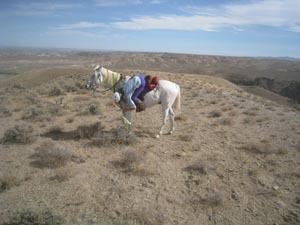 Here (on the white horse) I demonstrate the proper way to retrieve a ribbon. 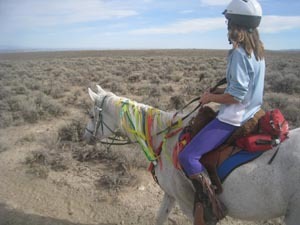 Although, if you'll notice, my ribbon was a few inches higher, and my horse was shorter or my arms longer than Connie's. 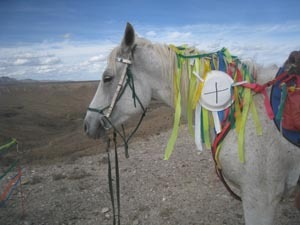 By now, our bags were getting full (most of the ribbons didn't have clothespins, and were just tied on the bushes), so we just started clipping any and all ribbons on clothespins in their manes, because the horses just looked cool. 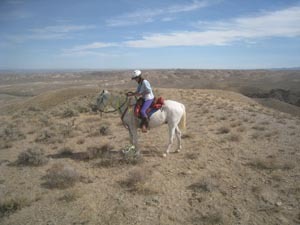 At the end of the trail on the plateau, we had a couple of paper plates to pick up; the horses wore them too. 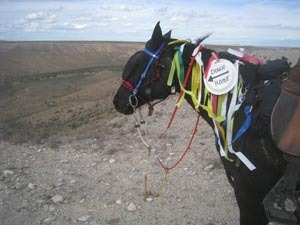 Next year when we put ribbons out, we'll put points on the ribbons. 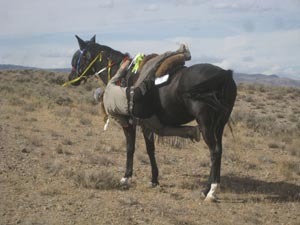 1 point for an easy ribbon, 3 points for a ribbon you have to lean out of your saddle for, and 5 points for a ribbon near the ground. 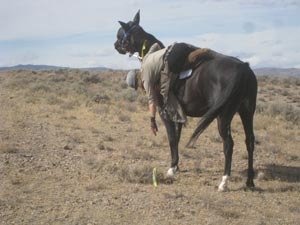 The things a horse has to put up with!